After their hard fight the previous day, the men of Manning Force’s brigade still had a lot of work to do when they awoke on Friday, July 22. They had slept amongst the casualties from the day before and there had only been a few scattered thunderstorms to breakup the intense heat that also took effect on the fight’s corpses. As the soldiers stirred, they returned to unfinished business. Yesterday the men had started to reverse the Confederate trenches that had been manned by Patrick Cleburne. Now, in the early morning hours, Illinoisans and Wisconsinites returned to that work. Using the available shovels, the soldiers also used their bayonets, plates, and hands to dig trenches and ditches that faced towards Atlanta. By the time they were finished, they would be able to stand in their own works and fire towards Atlanta, but still have the rebels’ old works to their rear. Though no one knew it at the time, that fact would become crucial for the battle of Bald Hill in just a few hours. Manning Force oversaw his brigade’s work while his division commander, Mortimer Leggett, checked in with the rest of his brigade commanders. The Seventeenth Corps commander, Frank Blair, Jr, was further away, closer to the army headquarters of James McPherson. This disjointed command scenario would also play a role in the upcoming fight. Without strong, central leadership, the fighting men of the Army of the Tennessee would look to lower echelon commanders, like Force and others, to lead them through the bloody gauntlet. While the soldiers of the Federal Army of the Tennessee dug into their positions around Bald Hill, their Confederate counterparts in the Army of Tennessee were finishing up a rare nighttime march. Reeling from his first defeat at the Battle of Peachtree Creek on July 20, John Bell Hood had looked, and found, another tactic. He would draw on his experiences from the Army of Northern Virginia—he would emulate Robert E. Lee and Stonewall Jackson. Or at least he would attempt to. 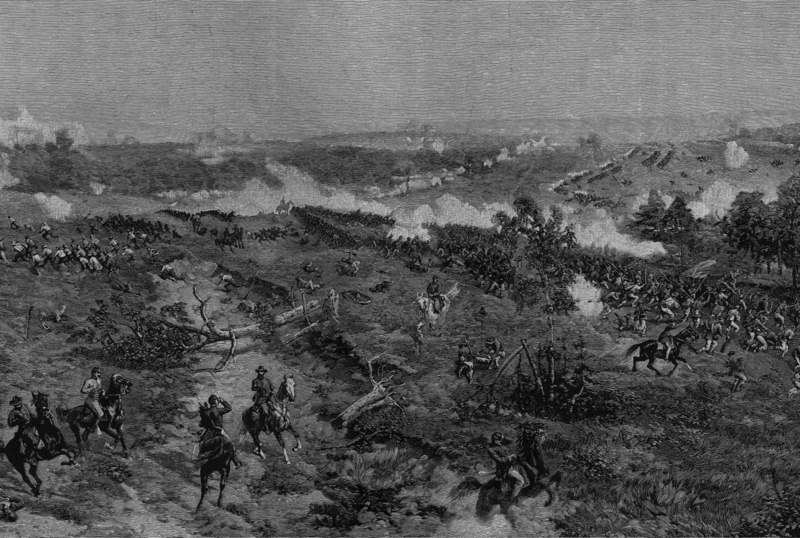 Finally in position, arrayed in a battle line that was three divisions wide, Hardee launched his attack nearly seven hours late. Instead of early morning, upon unsuspecting Federals, the rebels attacked in the middle of the day into the midst of Union ranks that had known something was going on since last night. Stumbling through the thick woods, the Confederates soon ran into the trouble of retaining their battle lines as the thick foliage disrupted the long rows of soldiers carrying bayonet-tipped rifles. The three divisions became disjointed, with two wheeling away from Bald Hill, towards troops of the Federal Sixteenth Corps. As intriguing as that fight is, it is beyond the scope of this post. An inset from a map from the “Official Records Atlas,” showing the Union trenches on July 22. 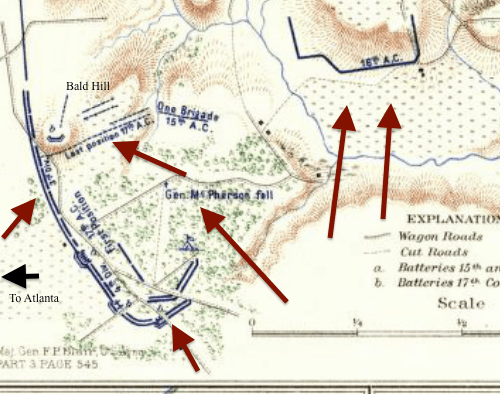 Force’s brigade was located on the center of Bald Hill. I have adapted the map by adding the red arrows highlighting Confederate attacks; the arrows do not indicate individual units, but rather the general direction of the attacks. With two of Hardee’s divisions moving east, the third moved northwest, battle flags waving above their ranks. This was the division of Patrick R. Cleburne and very early into the fight his men scored an incredible success: they killed James McPherson. The death of McPherson has been recounted elsewhere, and need not be repeated here, but it is important to know that once the Texans of James Smith’s brigade killed the young Federal commander, they pushed further into the Union lines. Beaten back by Federal reinforcements, the Texans reformed, wheeled, and moved towards the sound of the heaviest firing: Bald Hill. Bald Hill was a swirling mass of confusion, and Manning Ferguson Force’s brigade was in the middle of it. We last saw Force as he and his men continued building their fortifications in the early morning hours and now his troops were using those trenches to stop an unimaginable hail of lead. Right around this time, roughly 2:30 pm, Manning Force turned to a staffer and asked for a flag. The staffer, looking about at the mass of confusion and blood, scrounged around before finally settling on a piece of white cloth, which he held out to the brigadier general. And Manning Ferguson Force, in the midst of Bald Hill, exploded with rage. Force, remarkably, would survive his wound without serious eye loss. And, even more remarkably, he would be back in command in time for Sherman’s March to the Sea, just four short months later. The Battle of Atlanta was ultimately a Federal victory, and Bald Hill remained under control of the Army of the Tennessee, now under the temporary command of John Logan. Manning Force’s role in the defense of that hill cannot be understated, and two examples of his import can both be found in the words of Mortimer Leggett. Alongside Force, his brigade had 415 casualties, the most of Leggett’s three brigades. Manning Ferguson Force was given the Medal of Honor in 1892 for his actions on Bald Hill, and he died in 1899 at the age of 74. 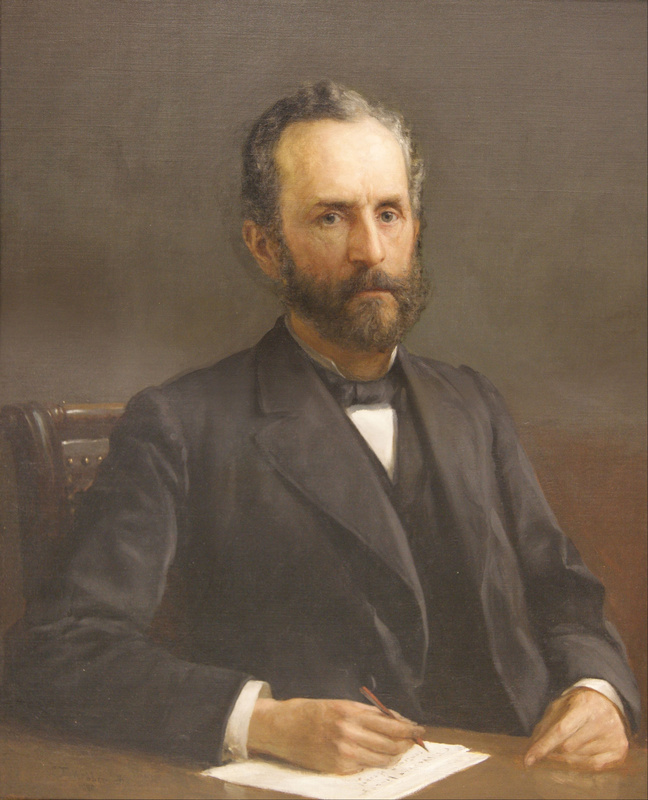 Manning Force later in life; scars from the passage of the bullet can clearly be seen. Thomas Lawrence Connelly, Autumn of Glory: The Army of Tennessee, 1862-1865. (Baton Rouge: Louisiana University Press, 1971), 446. Gary Ecelbarger, The Day Dixie Died: The Battle of Atlanta. (New York: Thomas Dunne Books, 2010), 68-69. Official Records of the War of the Rebellion (hereafter cited as OR), 38, pt 3, 564. Richard S. Tuthill, “An Artilleryman’s Recollections of the Battle of Atlanta,” in Military Essays and Recollections: Papers Read before the Commandery of the State of Illinois, Military Order of the Loyal Legion of the United States: Volume 1, 1891, (hereafter cited as Tuthill) 302. Russell S. Bonds, War like the Thunderbolt: The Battle and Burning of Atlanta. (Yardley: Westholme Publishing, LLC, 2009), 156. Mark M. Boatner III, The Civil War Dictionary. (New York: David McKay Company, 1959), 287. OR, 38, pt 3, 566. Report of the proceedings of the Society of the Army of the Tennessee at the Fourteenth Annual Meeting, 1885, 480. This entry was posted in Armies, Battlefields & Historic Places, Battles, Campaigns, Leadership--Confederate, Leadership--Federal, Personalities, Western Theater and tagged Atlanta Campaign, Bald Hill, John Bell Hood, Manning F. Force, Manning-Force-series, Medal of Honor, Patrick Cleburne, Robert E. Lee, Stonewall Jackson, William T. Sherman. Bookmark the permalink.